Just looking to see what everyone uses for a cover. There are some out there that are well over $1000 and I only want it for when the boat is sitting at the storage place until i can use it again. This will not be used for towing just storing. I bought the cheapest one Academy Sports had. It was semi-universal, designed to fit 17-19 ft V-Hull boats. Think it was around $50 or $60. I put it on when While storing the boat year round and taking it on and off when we head to the lake and get home. It fits my 1930ss great and has a 3 year warranty. I have a Westland semi-custom cover. Was not crazy expensive but is a nice solid cover for storage. I don't trailer with it or use it while the boat is in the slip. I use it for winter storage as well as when it sits in the driveway. Does it go over the radar arch? The trade off starts with when high winds and rain attack & cause thousands of flapping a day . Sitting in a open area ? Needs some thought before buying. Able to prevent ….ANY RAIN..... From leaking in & causing mildew ? Oh boy. For a cruiser with cabin & 2nd level & roof sticking up things ? Several of the cruiser boats buy a custom made on the boat cover for just the antennas & stick up on the top roof The canvas guy cuts away all the roof cover where ever a stick up is. He makes individual covers & sews them on to the roof area. Works great for most boats. The bigger domes Are slip on with snaps or flappered zippers.. Both types work very well 10 or more years old. ALL used Sunbrella only. no, it has velcro & elastic openings that go around the arch. And no, it's not a tight seal so I typically put this cover on over my cockpit cover. It goes down over the rubrail so it keeps the boat clean. That's good. Radar arches seem to be the major sticking pain in the asss when it comes to these covers. I'm getting tired of shrink wrapping every year and looking for an easier alternative that is almost as effective. I bought a custom made Fisher canvas for my 255. It was used for 3 years , then the guy bought a radar arch and couldnt use it anymore. It is made out of Army duck. It works pretty good. It requires 3 16 foot 2x4's and some string. I bought a Budge Cover for my 257ssx with arch off of Amazon. It is a Ttop cover for 24-26 foot boat. They only last a couple of years before starting to fall apart but I only paid $200. There is a 4 year warranty and they did send me a new one by just sending pictures. So I can get about 4 years out of one which is cheap protection. 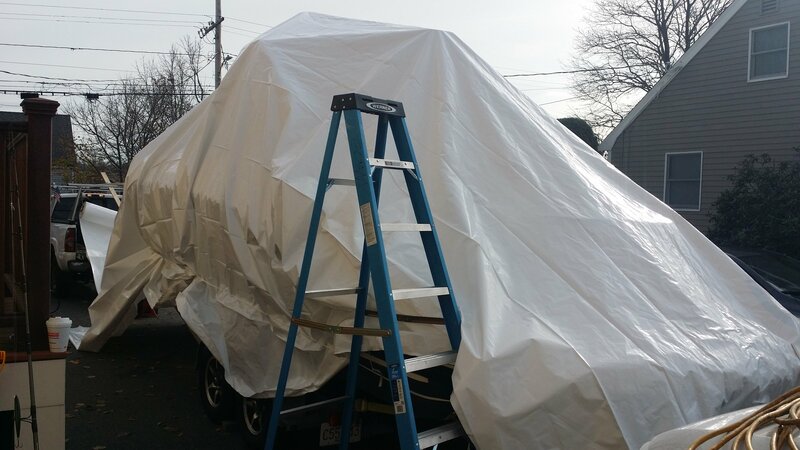 I store boat in my driveway and bought a dehumidifier at Lowes and run it under cover 24/7. Never once had problem with mildew inside and interior looks brand new after 4 years like this. 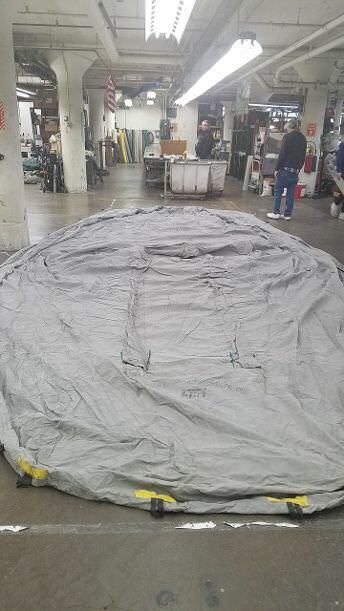 Hey I just wanted to let you know that on another forum, someone reached out to me who supplies heavy duty full covers for our style boats with arches and the cover fully covers the boat including over the arch. It also comes with different versions with cutouts for additional boots in case you have antennas or radars on the arch like in my case. This one (and he said it's specific to the 2010 276ssx) would come with a cutout for my radar with a tie-strap and a separate boot for the radar so I don't have to take it off. 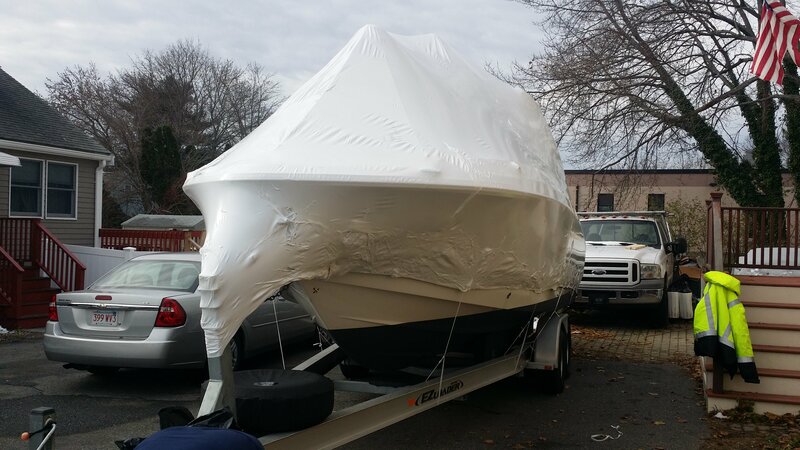 I actually did take it off to get the boat shrink-wrapped yesterday and it's pretty easy, but supposedly I don't have to do it with this cover. I just responded to him and waiting to see what he shows me and I'll let you know in case you or anyone else in the same boat (so to speak) is interested. In the meantime, this isn't something you see everyday. 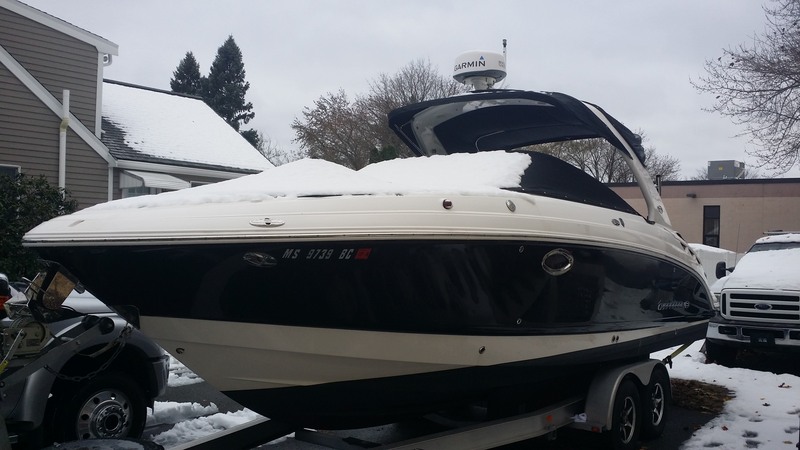 Snow on the boat, UGH! But thank goodness he came out yesterday and I was telling the other fellas on another forum that you really don't appreciate how much work it is to shrink wrap one of these things. It is a PAIN IN THE ASSS! A lot of work, and materials and special tools like the torches, especially the extended one to heat and shrink the high points. He even wrapped the trailer winch and outdrive for me. Great guy! Came out yesterday and not only was it a Sunday, it was his daughter's 4th birthday. I am planning to buy a cover from Coveranything today. I talked with one of their associates yesterday because they don't have an Exact for my model & year, and I also want to cover my teak extended swim platform, so I am getting one for a 26.5' Euro Cruiser (even though I have a 240 Sig) and see what happens. I want to keep the snow off of it while it is on my lift during its winter nap. My question is, should I cover the pros/drive with a trash bag or giant christmas stocking? Should I remove the props too? Here's the email he just sent me. My website is www.pmwinterboatcovers.com , and I believe I have the pattern on file for your boat. I will check in the morning. 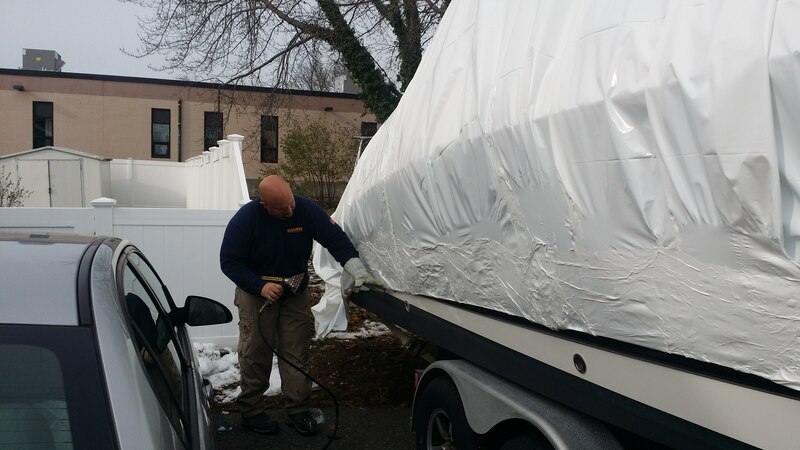 I can quote you a cover that covers the boat completely, down to the waterline. I will quote you 2 different materials, 1 is a winter storage cover and the other is a lighter, sort of year round material. I'll keep you posted once he sends me the quote. I always remove my prop for the winter and clean the shaft and load it with fresh grease. I made a shaft cover out of PVC pipe to protect the shaft. I take my prop inside, polish it up and store it inside. Thanks for the advice! Since mine is on a lift, I may have to get in one of my kayaks to take them off, but I agree it may be worthwhile. I like the idea of a pvc pipe. It wouldn't hurt. Thanks! Here it is, bro. It covers the entire boat including the arch and I'm having them install a zipper door. It's a cover for a 2008 276SSX which is exactly the same as my 2010.
its a little bit of work to get on. And it leaves a little bit of residue behind. And the cost (without shipping) is the same as shrink-wrapping. So if I can get 5 years out of it, it'll be well worth it and not just in savings, but the aggravation of going through that process. Something I learned with having a red boat in FL and AZ was the ability to cover the colored gel coat is priceless. I was fighting a lot of oxidation problems from the sun. So I had a cover made that extends down below the colored gel coat on the sides and life is good...I haven't fought with oxidation in the past 6 years. That said it was a custom cover made from sunbrella material and cost over 1K, but my point is for those of us that get a lot of strong sun on our oxidation prone colors, it was well worth the money to get it covered. The cover is still in great condition 6 years later by the way...love that sunbrella material. That's awesome, though. Still, beats the heII out of shrink wrapping. Interesting that it has those slots for the 2x4s. I think the one I'm getting also has a couple of those despite the radar arch. I think it has to for support and to create a tent effect. As long as the rain and snow slide off it, that's all that matters. Does it do a good job with that? Thx for posting those. I bought a Fisher cover when I bought my boat. My prior boat had one and it lasted 16 years! I bought a new one for it before I got my Chap. 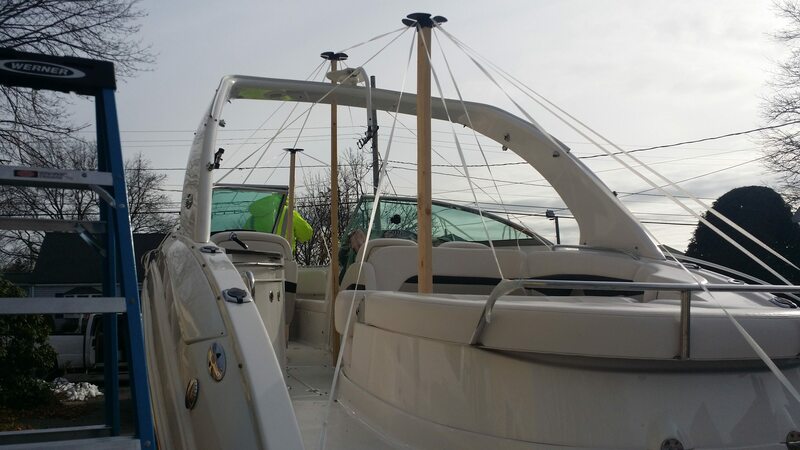 If you are going to keep your boat for 5+ years or more, it is a no brainer.